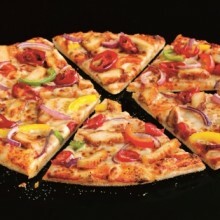 Pizza Hut Restaurants are passionate about pizza and serving their guests. They lovingly develop pizzas based on what their guests tell us they want...a range of bases - from deep pan, to the All American thin to our skinny 600 calorie pizzas. All topped with fresh toppings. Pair that with the fresh free unlimited salad, the unlimited soft drinks and unlimited Ice Cream - it's just, well, heaven. Pizza Hut Restaurants are passionate about pizza and serving our guests. We lovingly develop pizzas based on what our guests tell us they want...a range of bases - from deep pan, to the All American thin to our skinny 600 calorie pizzas. All topped with fresh toppings. Pair that with the fresh free unlimited salad, the unlimited soft drinks and unlimited Ice Cream - it's just, well, heaven.